RA talks to Drew Daniel and Martin Schmidt about micing cacti, counting with “the Bjork” and the philosophical dilemmas of live performance. While Matmos is often described in terms of conceptual frameworks and inspired sampling—bowing a rat cage or recording liposuction are but two of the most famous examples—the experimental duo’s dialogue of ideas, and the playfulness with which they perform live, is what has kept them relevant. Drew Daniel and Martin Schmidt are never content to stand still. Watching them behind their bank of instruments, which sometimes includes an Indian drum machine, a metal sheet, a spring reverb called The Moisturizer, a cactus and more, only reinforces the conversational aspect of their music. Known for their unpredictable shows, we caught up with the duo for the latest edition in RA’s Machine Love series to talk specifically about their live set-up. It was the afternoon before their performance at this year’s Mutek festival, a set which mixed tracks from their 2008 synth odyssey Supreme Balloon and from Treasure State, their recent collaboration with minimalist New York ensemble So Percussion. What pieces are you performing tonight? Martin Schmidt: To be honest, what we’re doing tonight, there’s not a hell of a lot of free improv. DD: What I was going to say is that’s it’s improvisation in that there are a lot of open choices about when you bring things in and how long you stay in them and what you’re doing on top of a structure. The structure isn’t cut out in advance. I don’t have a cut sequence that’s 200 bars and it starts and it ends. What I have is a lot of options I go through. What’s clear is that the song may have seven sections, but how long each section is and how busy it is and what we’re doing on top of those sections is freely determined in the moment. I’m calling that improvisation, but it’s not, of course. It’s not totally free, there’s just a set of options. MS: Yeah, it’s not free improv but it’s improvisatory. I am incapable of counting. I mean, I can count, I really can. But musically I can’t do it. It’s sort of a structure based on necessity really. Oh yeah, I should do this now… for a while. This caused trouble with the Bjork. During her songs, you’re supposed to be counting. And I kind of couldn’t do it. There was some trouble and she was patient… to a point. DD: We try to use our videos as graphic scores to drive our awareness of where we want to be in a piece. If we have a seven minute video, and the squiggly black circles are turning into red misty clouds, that means I need to bring in the Coupigny [a modular synthesizer used on Supreme Balloon] sounds and thin out the drum machine more and more. It’s almost like an alternate notation. What is your division of labor when you’re on stage, and how does that compare to how you would create these songs in the studio? DD: It’s a direct version of the songwriting process. I’m the rhythms and the sequences and Martin is the sort of extended musical passages and solos. He’s the sort of front person if you will. His ability to play synthesizers means he’s the one driving a lot of the more musical elements and I’m more of the air traffic controller directing when the beats come in. It’s not just playback. I use three different controllers so I have ways to transform the parameters of these sounds. What gear do you have on stage? DD: I have two laptops running Ableton Live that deliberately aren’t synched. I kind of punch in on the fly and join families of rhythms together, and because they’re not synched, I’m free to pull them apart, tempo-wise. I like the way our music kind of crystallizes and dissolves. That lack of sync is intentional. There will typically be a lot of impulse kits and samples that I’ve made in Ableton that are running rhythms that are being controlled by the Behringer Rotary Controller, which lets me thin out and alter pitch and other parameters around those rhythms on the fly. And then there are soft synths as well, which I’m driving. I use an [Akai] APC40 controller but I’m not so into the use of a clip window and using pads to trigger clips. It’s simpler for me to be kind of a mixer and guide big changes in the structure of the song. You won’t be tapping away, you just want to see the progression and map the progression. DD: Yeah, I’ve seen people who do that well. But for me, I’m not so interested in proving hey, I can be gestural, look here I am. When I want to do that, I’ll play The Moisturizer or I’ll use some other synthesizers, like the U73 oscillator that’s two oscillators multiplying each. There’s a lot of on-the-fly playing of synthesis, but that’s more where Martin comes in. He also plays a lot of objects. He has a microphone and a lot of percussive objects that he’s playing. Martin, can you describe your set-up? I’m specifically curious about replicating or having the synths on stage, because something like the Coupigny is quite rare. MS: There’s only one Coupigny. I wish we had it, though I don’t think we’d drag it around. DD: You toured with an ARP. MS: I toured with an ARP 2600, and that was incredibly inconvenient. DD: We’ll be playing contact mic’ed cactuses on the So Percussion tour. We use this thing called a Barcus-Berry Planar Wave Transducer that’s a great contact mic. MS: It’s so much louder and has so much more frequency response than a Piezo. Have you been using this for a while? MS: Yeah, we were turned on to it by this guy at one of the fancy art venues I play in. DD: We were about to play the rat cage piece (“For Felix (and all the Rats)”) and he brought it out and we couldn’t believe the sound. Ever since, we’ve been real believers in the Barcus-Berry. MS: I think it’s mainly for piano. It’s a small chunk of brass that needs phantom power, so it has its own preamp built into it. It’s a $500 contact mic. DD: You get a much better sound. And when you stick it on a cactus, you can’t believe the range of sounds you get. It’s a beautiful thing. MS: We actually shove it between the needles and the folds of a cactus. It’s not a saguaro, it’s one of those basketball-sized ones. If you stick it in the right place, as long as you don’t tear your hand apart, the spines sound like a kalimba. I knew this would go in an interesting technical direction. When you talk about replicating or sampling synths, how do you do it? How is it different than what you did on Supreme Balloon? DD: Oh sorry, so there’s one analog synth on stage and then my U73 is also an analog oscillator. 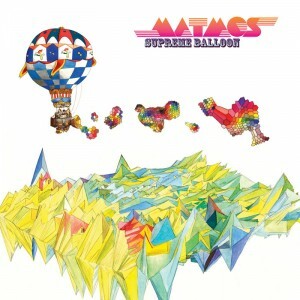 So there’s some analog synthesis but when we’re reproducing the song “Supreme Balloon,” there’s a lot of soft synthesis. I’ve been enjoying ACE (Any Cable Everywhere) a lot. It’s a really cool one that models modularity. It’s one of those highly patchable interfaces. MS: The Coupigny sounds on the records are from long recordings of the Coupigny that we cut. I don’t think we ever play a song live that has any Coupigny on it. DD: The end of “Rainbow Flag” does. MS: OK, so there’s some sound files of that. DD: There’s a great bacon frying sound it makes that I like to bring in on the end. MS: It’s a mega combination of sound files, soft synths, newer digital synths and older analog synths. DD: Playing electronic music live raises the question of how to avoid your own control freak desire to avoid error and embrace something the audience can actually perceive as being built up live. That’s a philosophical dilemma. Why should I prefer something where the edges the seams are showing when I can play something perfect? The problem is that it’s too easy to be perfect in electronic music. That’s why I don’t sync my two laptops. That’s also why, instead of sending MIDI to Martin’s arpeggiator during “Supreme Balloon,” Martin dials in something tempo-wise that’s more or less close but you can perceive the difference. The beating against itself of very similar forms is where a lot of the life happens. MS: Or a lot of the lack of quality. Sometimes, it doesn’t work out. It’s weird, it’s mostly a philosophical problem. Does the audience perceive it? One imagines they do, but that’s from my position. If we leave a lot of it open to chance and more organic decision-making, surely the whole thing will come across as more organically generated. I’ve never done science on this or audience polling. DD: I think what you have to do is go too far in modeling the process and hope the too far will mean that even the people sitting in the back have to get it. We do that in a literal way playing “Supreme Balloon” live. At the end of the piece we pull the sound out of the PA and I walk through the crowd holding a Radel Taalmala, an Indian 808, an Indian drum machine. It’s something that I sampled and people have been hearing me play a sequenced version of it. I walk through the crowd so they can encounter the source, the original object that’s been chopped up and cycled. It’s back to the source in a real, literal way. People have to encounter a real, specialized, real-time event. You moved from San Francisco to Baltimore not too long ago. How has the new setting influenced your music? DD: It’s a much poorer city and people don’t often have laptops. They’re much more likely to build kits of oscillators with their friends, to literally harvest junk and go to the dump to find a thrown-away ARP Quadra and try and fix it. Through Martin working at a record store called True Vine, we got to know an engineer named Karl Ekdahl who was fixing people’s gear and is a very gifted designer of synthesizers and instruments. There’s a very fertile instrument building community in Baltimore. This guy Peter Blasser, he designs some incredible, interesting gear. The cliche of circuit bending is I cracked open a Speak & Spell and made it fart out its memory chips, which is a nice cute thing to do, but isn’t really all that compelling, ultimately. People like Peter and Karl are designing instruments with a lot more poetics to them. MS: I think they both came from circuit bending. I think circuit bending was a way for a lot of people to realize electronics wasn’t this utterly forbidding territory of pencil-necked engineers. Do you see these ideas intersecting or overlapping with some of your thoughts on sampling? DD: The focus on the organic immediacy of a real object is what drives our sampling. It’s been interesting to meet instrument builders who want the same immediacy in electronics. There’s a shared philosophy. To play the Moisturizer, an instrument which Ekdahl and Martin developed with Jason Willett, is to play a physical object, a spring, and treat it as an instrument rather than processing. It’s been weird to watch this DIY spirit of anarchist circuit bending turn into a small business model. It’s done on such a ghetto level that it doesn’t seem so creepy to watch. Martin and Karl have a world map they put up where they put pins up where people have bought them. Some people have bought them in Russia. It’s pretty cool. Stephin Merritt from Magnetic Fields and Sleazy from Throbbing Gristle have one. It sounds like what you’re doing on stage is the same process as what you would do in the studio. DD: That’s why it’s so goddamn expansive to tour. It’s not just here’s a laptop with everything we need, though we could slim down if we wanted. MS: We bring all our synths. MS: But the world keeps fighting us. The price of doing this has just gone up and up and up. MS: They charged us $225 to bring our gear, and that wasn’t punishing us for being overweight. That was standard. DD: The most we got was on a flight from Germany to Japan, when we were touring as a trio with Jay Lesser. They weighed our gear and said, “That’ll be 4600 euro.” We had to work with a cargo company. MS: We got it down to 1000 euro. We were bringing so much stuff. Jay brought his modular rig on tour. That’s been part of the process of turning Supreme Balloon into something that you can tour. You need MIDI and a lot of different eras of synthesizers to speak to each other. How does the process of using MIDI to get different generations of synths to speak with each other? DD: It’s just literally about making different eras of synthesis synchronize. We had Jay Lesser build us a MIDI-to-CV converter so that we could trigger our ARP 2600 with MIDI, and we often use the 707 as a way to send MIDI into the drum machine and then out to the Roland SH-101. There’s no reason that working digitally means that you have to turn your back on what past eras of analogue and modular equipment have to offer. You just have to do the work required to translate things sometimes. In terms of mixing these sounds and techniques, we are not purists and we want to create a hybrid music that isn’t easily slotted into either camp. What was the influence of working with So Percussion [on the new album]? What was the influence to your work of playing live with them? MS: Well, besides Bjork, when we were working on her record, we never made a record with someone else where their decisions had to absolutely count in the long run. DD: Because of their training and their chops, you can ask, “Can you do fast runs on the glockenspiel in this time signature?” and out it comes. They have a level of playing that I associate with machines that they can just do. MS: We are baroque. We’re rococo. We’re like a million cluttered thing. DD: They have an ear for a melodic phrase you can hang out for a while and that’s enough. MS: They have these long beautiful sounds and it takes every ounce of Zen in me to not say hey, can we go [weird garbled noise] on top of that? DD: I think we complemented each other very well.